This year’s IBC is a particularly special event, though. It is 50 years – almost to the day – since the very first International Broadcasting Convention, held in London in 1967. Authorities from Edmund Burke to Lemony Snicket have said words to the effect that “those who don’t know history are doomed to repeat it”. Can IBC67 tell us anything useful? The way we make and distribute content today is completely different to 50 years ago, the most startling difference being that most of it was still in black and white. The big drama hit of 1967 was John Galsworthy’s The Forsyte Saga, which occupied primetime Sunday for no fewer than 26 weeks from January to July. For decades after, audiences talked of the wonderfully colourful dresses in The Forsyte Saga, but it was shot and broadcast in black and white. Colour came to Europe that year with the launch of BB2 (controller not-yet-Sir David Attenborough). It was tennis from Wimbledon that first saw colour broadcasting (John Newcombe was men’s champion; Billie Jean King beat plucky Brit Anne Hayden). Attenborough was asked to come up with a primetime show that would drive sales of colour receivers, and invented the one-frame snooker championship Pot Black in 1969. In Europe we bought a lot of television programmes from America (so no change there then). Family cowboy saga Bonanza was popular, as was an emerging hit sci-fi show called Star Trek. Top sitcom was Bewitched. These all arrived on our shores as cans of film, so telecine was not a creative art but a practical solution to the transmission of recorded content. It is no surprise, then, that one of the founders of IBC was John Etheridge, then general manager of the broadcast division of Rank Precision Engineering, which shortly became Rank Cintel, Rank Brimar (maker of the CRTs) and Rank Taylor Hobson (now back to its original name of Cooke Optics and still making some of the world’s best lenses). Etheridge’s two partners behind IBC were from companies now forgotten, at least in the industry today: John Tucker of EMI and Tom Mayer of Marconi. As an aside, this was the foundation of the spirit of co-operation which IBC celebrates, as they were fierce competitors in business. EMI and Marconi had each developed a colour studio camera and were keen to become the preferred choice. Many of the vendors who took stand space at the first IBC are no longer with us, but several are. I have already mentioned Cooke Optics, which pre-dated television let alone IBC. Photon Beard was founded 134 years ago: Peter Daffarn still talks about the traumas of moving from gas lighting. Vinten, too, is more than 100 years old so a long established business in camera supports by 1967. Back then it was showing the latest models in pedestals and pan and tilt heads, capable of supporting “cameras weighing from 100 to 500 pounds”. I’ve just done a back of envelope calculation to work out that an Arri Alexa with Cooke lens and accessories would be 11kg tops. The 1967 Vinten capacity for 225kg cameras seems very over the top to our eyes. Facts like the weight-bearing capacity of a head were very much in people’s minds at the first IBC. Technical specifications were everywhere. Scully, for example, wanted visitors to know that its range of audio recorders featured total harmonic distortion less than 0.005% at +18dBm. When was the last time you made a buying decision based on that sort of data? Jumping forward to now, what are the questions that will be on people’s lips at IBC2017? There are the obvious hot topics around IP connectivity and the SMPTE 2110 set of standards, and that is a really important issue for today and tomorrow. But what else will people be talking about? I’ve got a couple of strands in mind which I think might move from slow burner to hot topic this time around. Ah yes, but Bogdan Frusina, founder of Dejero, warns that 5G “is not a standard yet. It is not a single technology: it is a way of managing a network using a combination of technologies. The the challenge is spectrum – and that is always limited. Dejero is keen to exploit ever-faster connectivity because it provides bonded cellular transmission systems for live broadcasting. It has now added the ability to blend cellular circuits with Ku-band IP satellites, which could have a big impact. Rival company LiveU recently worked on a project which is unlikely to be helped by 5G networks: live coverage of the annual reindeer migration across the Norwegian wilderness, for NRK’s “slow TV” project. 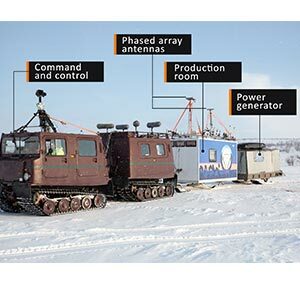 Radionor helped out by building a microwave-based phased array mesh network, reconfiguring it as they went because the reindeer, unaccountably, did not follow a pre-planned route or timing. But they achieved 150 hours of continuous live transmission. I think new ways of getting the signal from the event to the host to the consumer will be one of the issues people will be talking about at IBC. The other is whether this artificial intelligence, machine learning concept has any legs in our business. Companies like Amagi are promoting their concepts at IBC this year. But the most significant advance comes from TV Globo in Brazil. A group of engineers at the company is to take home the IBC Conference Prize for the best paper, for their work on big data, business analytics and machine learning. The systems allow them to create better news content, as well as provide much stronger content recommendations for subscribers. It is a real pointer to the way ahead. But what do I know? The real hit of the show could come from any one of the 1700 exhibitors I have not mentioned. If you are going to be in Amsterdam, I hope you find what you are looking for, and I hope you find something that you were not looking for but is going to change your business. I might see you at the new Beach, weather permitting.